It is so much easier to say thank-you to a deity that we have personified than it is to give thanks to a deity that is Beyond the Beyond and Beyond that Also. 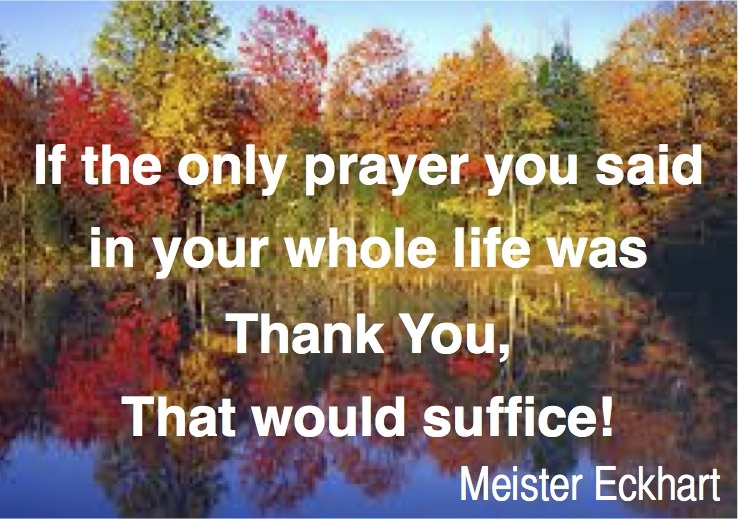 Our thank-you’s to the One in whom we live and move and have our being, tend to be expressed in words that are so much more awkward than the simply “Thank-you Father” that sufficed when we personified God. Thanksgiving is certainly easier when you personify God. I have said over and over again that there is absolutely nothing wrong with personifying God. Indeed, it is part of our human nature to personify things. Personification is how we relate to something that is not a person. Personifying God is only a problem when and if we actually begin to believe that God is a person and we then go on to worship the person who we have created. The One in whom we live and move and have our being, lives and moves in, with, through, and beyond us. Which means that each one of us is in God and God is in each one of us, so expressing or gratitude for the many blessings that we enjoy moves our attention beyond ourselves to those around us. Embodying our thanks, takes on whole new dimensions when we begin to see God in, with, through and beyond all of creation. We all have a lot of learning to do if we are ever going to learn to give thanks to the source of our being, the One who lives and breathes in, with, through, and beyond us. When little children are learning to talk sometimes it is difficult for them to say the words, “Thank-you”. In my family, we used to encourage babies to say “ta” or “ta, ta” as a first step along the way to learning how to express their gratitude. As we learn and grow in our knowledge of the ONE who is the source of our blessings, we use words like, “LORD”, “FATHER”, “MOTHER”, “REDEEMER”, “SAVIOUR”, all perfectly good attempts at expressing the inexpressible. So, if personifying God, helps, then by all means personify God. Just remember that your personifications of God, are not God, for they will always fall short of expressing that which is beyond language. As we continue to live into our full humanity, we will continue to learn to notice, and name our blessings, and we will learn new ways of expressing and embodying our gratitude as the LOVE that is the source of our blessings continues to flow through all things. The One we seek to offer our thanks and praise, the One who is the source of all our blessings is the one we call God. The ancient Greek noun for God, is theos; we get our word theology from it…theology means words or ideas about God. The ancient Greek noun theos, was derived from the Greek verb theo, which means to flow. Our ancestors, described God as the Light that flows through all things. Jesus taught us that God is Love. As followers of Jesus, surely we can begin to understand God as the LOVE that flows through all things. Let our Thanksgiving celebrations open us to the realities of our many blessings and let those blessings flow through us. May our God who is LOVE, flow in, with, through, and beyond us so that everyone may know the One who in whom we live and breathe and have our being, by our love. Let us remember that LOVE flows both ways. Just as surely as our blessings flow through us, so too, the pain of our sisters and brothers flows. Let us remember that we are intimately connected one to another. Even though the LOVE that lies at the very heart of our existence is beyond our ability to imagine, it can be embodied in the love that flows in, with, and through us. Let that LOVE who is the ONE to whom we offer our thanks and praise, flow through us. let the LOVE flow as we embrace family and friends, and then as the knowledge of our many blessings washes over us, let us act out of the abundance we share, so that the LOVE, the ONE who IS, Was, and Evermore shall be the source of our blessings might flow. Let our gratitude take on flesh and live among us, so that all may know the LOVE who is God. Let our gratitude live and breathe in, with, through, and beyond us. Let LOVE flow from each one to each one. This entry was posted in Adult Education, Bible Study, Home, Progressive Theology, SERMONS and tagged Pentecost 21C, progressive Christian sermon John 6:24-35, progressive Christian sermon Luke 17:11-19, progressive Christian Thanksgiving sermon, progressive Thanksgiving resources, progressive theology, spirituality, Ten Lepers by Rev. Dawn Hutchings. Bookmark the permalink.